Monkey D. Luffy and the Straw Hat Pirates are getting a live-action version, but it might not be one you’d expect. One Piece is being turned into a kabuki play that will center on the Summit War Saga and, according to Natalie, will be done in a way that audience members who aren’t familiar with this One Piece story arc can still follow. The production also aims to remain faithful to the way the characters talk in the manga. Kabuki actor Ennosuke Ichikawa IV will not only play Luffy, but also the characters Shanks and Boa Hancock (in kabuki, there are only male actors). Yukan News reports that the kabuki production will feature around thirty One Piece characters. 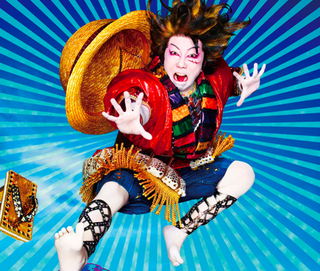 The One Piece kabuki play will run from October 7 to November 25 at Tokyo’s Shinbashi Enbujo.